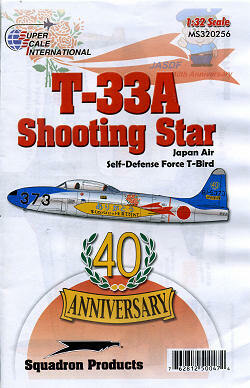 Another fine T-33 sheet is this latest one from Superscale. 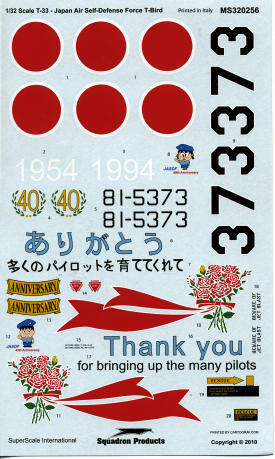 It is for a very nicely marked Japanese Kawasaki T-33 painted in a special scheme for the fortieth anniversary of 501 Squadron in 1994. 501 Squadron flew RF-4Es at the time and still flies the Phantom, though now they are F-4EJkais and carrying a recce pod. The aircraft is overall natural metal with FS 15180 blue nose and tail section. The outer wing tanks are FS 13538 yellow. Black is used for the inner tanks and the wing walk areas. Now it may be that this plane is overall aluminum lacquer as frequently JASDF 'metal' planes were painted to reduce corrosion concerns, so finding a photo of the plane would be quite helpful. Though the instructions do not show it, the English markings probably go on the outside of the right hand wing tank. The markings are designed for the new Czech Model 1/32 T-33A. The decals themselves are in perfect register and printed by Cartograf in Italy. A full color markings and painting guide is now the norm with Superscale. Review copy courtesy of Squadron Products. Get yours at your local shop or on-line retailer.